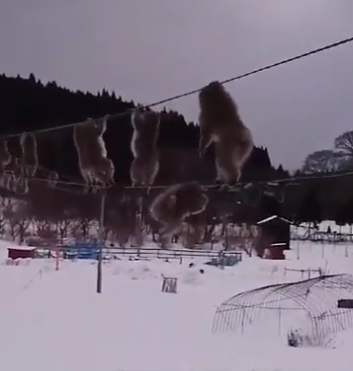 It's a high-wire balancing act, and a video showing a troupe of daredevil monkeys strolling along cables above snow-covered ground in northern Japan has gone viral. "Look at this! Impossible!" a woman says in the 71-second video clip that has been viewed nearly a million times since it was posted on Twitter on January 7. The clip shows a stream of the monkeys deftly shuffling along a cable, gripping one below with their feet and an upper one with their hands. As the camera rolls, one after another the monkeys make their way, their furry behinds wiggling as they tiptoe along. "How many, how many, how many of them were there? It's amazing," the woman says. The clip was uploaded by Twitter user @baritone_666, whose mother shot the images in the rural city of Mutsu, more than 600 kilometres north of Tokyo. Monkeys live across large parts of Japan, and the country is famous for its snow monkeys, who attract hordes of tourists eager to spot the animals relaxing in hot springs during the winter months.